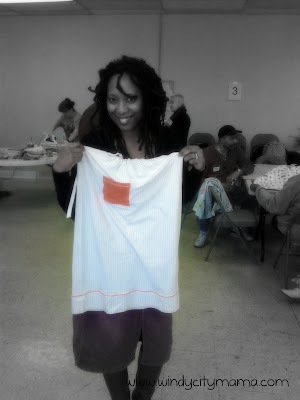 Last week, I attended the 2nd Annual Haiti Pillowcase to Dress and T-Shirt to Shorts Sewer Workshop. I participated in the creative and sewing process of turning donated pillowcases into dresses that would go to Haiti. The first dress. The pocket is off center a bit. I haven't done hands on volunteer work in a long time. I usually donate money because past projects were socially awkward for me. 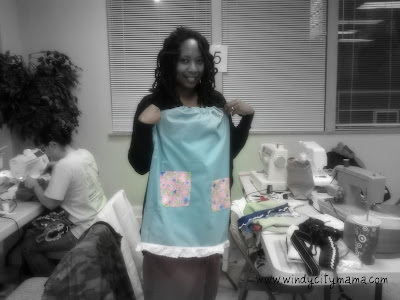 I decided to give this one a try because there was sewing involved and it was with a meetup group I belonged to. It was a wonderful opportunity to step out my comfort zone. If nothing else, I could bury my face in the machine. As usual, I'm glad I pushed past the fear. I had a great time sewing. I haven't made anything in over 2 years. I love hearing the machine go, being covered in clipped threads, and watching the fabric turn to into something wearable. It was nice to have TWO completed projects and it a good cause! I also met some new people (shout out to vision board 2012). Two ladies even joined TSC. I came home super pumped to keep the sewing mojo going but alas it has passed and I still haven't worked on a new project. The second dress. These pockets line up better than in the picture. Do you participate in volunteer activities? What sparks your creative mojo? Giveaway ends on Monday! Enter here. How wonderful that you were able to push past and volunteer! I volunteer at my church, I also make blankets for Project Linus. :) Have a wonderful weekend. I don't think those little girls are going to care about the pockets on the most beautiful dresses they've ever owned. I am proud of you! this is very inspiring! i hope to be in Haiti this summer! Thanks everyone! I'm going to look for more volunteer opps like this. Any suggestions?